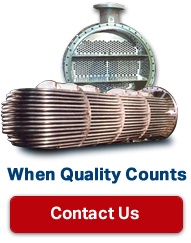 To be the first choice when our customers need quality heat exchanger or condenser/chiller tube related services. To be the one-stop shop for eddy current testing, remote video inspection, belzona epoxy coating services, condenser or heat exchanger retubing, ASME code repairs, welding, and fabrication. Condenser & Chiller Services exists to serve our customers' needs by providing quality heat exchanger services and repair solutions. We provide our employees with growth opportunities and training in our service and repair business, along with great benefits in both health, retirement, and profit sharing programs. For 30 years, Condenser & Chiller Services, has been inspecting, repairing, upgrading, welding, coating, and retubing heat exchangers and chillers throughout the United States. We have also provided this same quality service in many other countries for both American and locally owned businesses with chillers or heat exchangers. We have also inspected and retubed thousands of condenser and evaporator tubes on cruise ships and Marine-NOAA ships. We are experts in the repair and building of replacement shell and tube heat exchangers, U-tube bundles, condensers, evaporators, chillers, absorbers, reboilers, and ASME pressure vessels. We serve our customers in the following industries: aerospace, energy-cogeneration, commercial real-estate, hi-rise, hotels, government GSA offices and military installations, petrochemical, pulp and paper, commercial marine, navy, hospital, specialty chemicals, food processing, colleges and universities, school districts, ice rinks, geo-thermal, wastewater treatment, amusement parks/resorts, and many more.